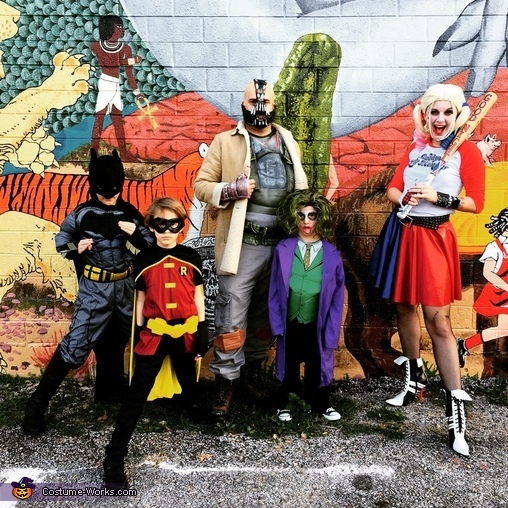 Dad was Bane, Mom was Harley Quinn, Noah was Batman, Reagan was Robin, and Alex was the Joker. Bane was a mix of a store bought costume and a jacket we owned, and added knee pad accessories and thrift store pants. Harley Quinn was a handmade skirt, shoes bought second hand online and handmade necklace made from a belt and foam paper. The boys costumes were store bought with some added touches like boots, and makeup.